InstantPHR®—an untethered personal health record solution—beats out all major industry competitors. Chilmark Research graded the 14 patient engagement technologies based on their product capabilities, including functionality, usability and operational utility, as well as market vision and market execution. 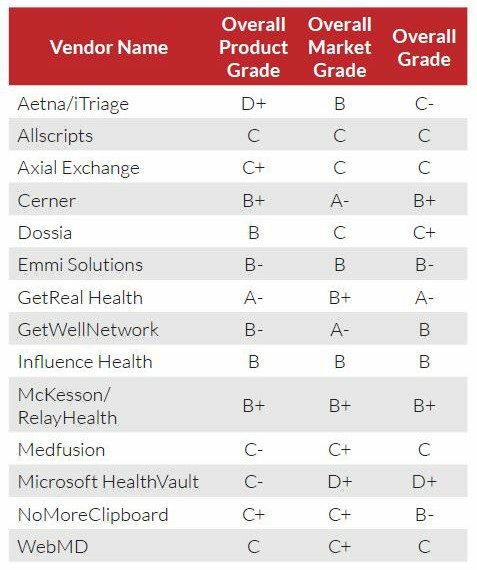 Get Real Health received a grade of “A-” for its product capabilities and a “B+” for its market capabilities for the overall grade of “A-.” This was the highest grade among the 14 competitors, which included Allscripts, Cerner and WebMD. Increasingly, patient engagement is a major factor in helping healthcare organizations improve health outcomes while cutting costs. Get Real Health, the report noted, is one of the only products available on the market today that focuses on long-term success by giving patients and providers “a complete engagement offering” that goes “beyond standard VDT [view, download, transmit] and communication features” mandated by the federal government as part of Meaningful Use (MU) requirements. As Chilmark researchers stated in the report, “[P]olicymakers and thought leaders are scrutinizing a paternalistic tradition of health­care delivery that needs to be updated if goals for reform and cost containment are to be realized. Alongside this shift, advances in personal technology and consumer convenience are reshaping expectations for the pa­tient-provider relationship.” To this end, Get Real Health’s InstantPHR® offers healthcare organizations a highly adaptable portal that connects provider-generated data from one or more clinical systems with patient-generated data entered via the web portal, mobile apps, or any one of the hundreds of connected health devices. Rockville, Maryland-based Get Real Health specializes in providing an untethered PHR solution at a system-wide level to healthcare organizations, non-profits and governments around the world. Our award-winning product — InstantPHR® — is a bidirectional data sharing patient engagement platform with tools that empower patients to be an active part of their care team. We help organizations meet both current and future needs such as chronic disease management, mobile strategies, remote patient monitoring, wellness, as well as Meaningful Use 1, 2, 3 and beyond. Get Real Health has strategic partnerships with industry leaders including Orion Health, TELUS Health Solutions, Caradigm, Telstra Health, Microsoft, and HumanAPI. Visit: http://getrealhealth.com/, or watch a two-minute video at http://vimeo.com/86727501 to learn more. Want to see a demo of InstantPHR at HIMSS15? Visit us at booth #8736.